Children's Hospital - Mascott Equipment Co.
Project consisted of replacing two existing 15,000 gallon STI-P3 tanks with two new 12’ diameter, 20,000-gallon fiberglass double-walled tanks with brine-filled interstitial space. Two submersible pumps in each tank deliver fuel through a pair of fuel oil supply lines to the 1,000-gallon Intermediate Tank approximately 400’ away. Each tank is capable of pumping through each supply line for maximum redundancy. The Intermediate Tank is equipped with dual return pumps feeding dual return lines for fuel maintenance and overfill prevention functions. 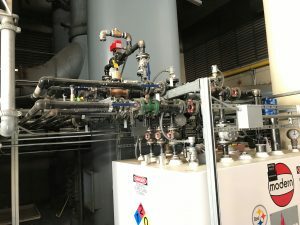 An Omntec OEL-8000II tank monitoring system and a Vaporless CFOSI (Coordinated Fuel Oil System Integration) controller are used to monitor the main underground tanks, piping and leak detection and the Intermediate Tank level to initiate refill or overflow return sequences to/from the underground storage tanks. A Fuel Technologies 20A system filters the fuel in the underground tanks on a scheduled basis. 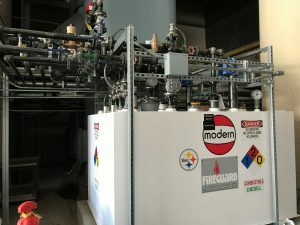 The existing boiler and generator systems that had previously drawn fuel directly from the old underground tanks were reconfigured to draw fuel from this Intermediate tank. We Can Help! Mascott extends an invitation to our commercial customers to learn more about how we can assist you with your emergency power equipment and service needs. Thank You.